This episode was based on the novel Murder in Mesopotamia, first published in 1936. It was adapted for television by Clive Exton (in his final Poirot outing!) and directed by Tom Clegg. Exton stays more or less faithful to the source material, with some exceptions. Let me tackle the two major ones first. For one, Hastings is added (a massive strain of credibility, if you ask me, but there it is). He becomes Bill Coleman's uncle (!). This, of course, significantly reduces the role of Nurse Leatheran - the narrator of the novel. Much like in The Murder of Roger Ackroyd, her main function becomes that of a further suspect. Moreover, Poirot visits the area not because he is on holiday, but because Countess Vera Rossakoff asked him to. Now, if adding Hastings doesn't stretch credibility, then this certainly does. 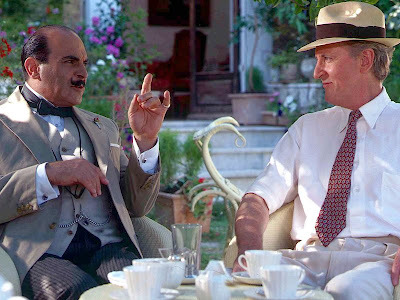 I could agree that Poirot would go to extremes to help the Countess, but would he really go all the way to Mesopotamia just because she says she needs his help? I can't really see that happening. It gets worse, because the resolution of the matter is that she has fled the scene and he is left paying her hotel bill! It's all very strange... Anyway, let's go back to the changes. Exton adds an opening scene in which Mr. Mercado kills an Arab drug dealer (later scenes will link up to this, too). Dr. Riley, Mr. Reiter and Mr. Emmot are removed; the first, due to the fact that Nurse Leatheran's role is reduced and the others because they didn't really serve any purpose other than provide potential candidates for Bosner's brother. Consequently, the key 'Bosner suspects' become Father Lavingny, Mr. Carey and Bill Coleman. Moreover, all the interviews are somewhat shortened, but that's only to be expected with the time constraints that a television episode demands. A somewhat more significant change is that Mercado commits suicide at Poirot's hotel in Baghdad (he couldn't stand the guilt of having killed the drug dealer). Finally, there's a lovely bit of behavioural comedy with Poirot and a mosquito at the camp site. All in all, though, the minor changes make sense (I won't mention the two big ones), and the faithfulness isn't half bad, if you can get past the two changes I mentioned initially. Clegg makes great use of the exotic location in this episode. In real life, the dig is an archaeological site in Tunisia, called Oudhna. Gunning's soundtrack goes brilliantly with the direction and the location, and I do wish the score had been released at some point. To see Poirot out of his element, so to speak, in an exotic location, is always a joy. Also, as much as I dislike the additions of Hastings and the Countess, they do provide some bits for Poirot's character development. As an aside, I'd also like to point out that Exton underlines the fact that Coleman is Hastings's adopted nephew - a plot point that might come in handy in Curtain, if my suspicions concerning Judith Hastings (see the chronology blog) turn out to be true. Of the guest actors, there are no real standouts, but they all portray their characters accurately and seem more or less suited to their roles. Poirot's travelling to Baghdad I could believe - I think he would go far for an interesting problem to solve, love interest or no. It might sound funny to say that the Countess tricking him into paying her bill seems "out of character" - - if you believe she's just an all-around con-woman then it makes sense - but it's not in sync with the character from either the Double Clue episode or the books. Poirot himself always says that criminals have their own MOs and patterns. And the Countess's has always been stealing jewels. Alice even says in Cerberus "it's always jewels, never money." And in the Double Clue adaptation she shows every sign of genuinely caring for Poirot, as opposed to using him. Sometimes the stealing seems as much kleptomania or some kind of compulsion or thrill-seeking as a financial thing. In Double Clue adaptation the stealing and the selling of jewels could point to financial difficulties, but she seems to be doing a good job of putting up a facade of wealth, what with the way she dresses, where she is staying, and getting invited to a lot of high society events. And we don't even see Poirot treat her to meals - he sighs in admiration over the picnic SHE has prepared. The exchange in Double Clue,"Where are you taking her?" "It is the Countess who takes me." seems, on the surface, to mean that she is paying for outings...but I wondered if had multiple meanings. The reference to "settling up the next time she sees you" however, foreshadows that they intended to bring her back again in the series and MIGHT even hint that they have seen each other some time since The Double Clue. This is one where I'd like to see more aggressive moralistic-ness by Poirot. It was a particularly brutal way of killing someone, done in cold blood. Both the filming and the book try to manipulate us into feeling sorry for this killer just because it's such a torment being in love with Louise? We don't really even know if she was really "cheating" especially in the book. That she is alleged to deserve it because she "tormented" men with her charms while at the same time preferring her independence is particularly off-putting. We do know that Poirot doesn't let the killer get away, however; there's a scene of an arrest - and the killer seems not to mind much, in fact. Is there an implied parallel between Louise's behavior and...what's going on in Poirot's own personal life? Could that be the reason for the addition of that sub-plot? One of my least favourite books and adaptations, mainly because it's utterly ridiculous that Mrs Leidner wouldn't recognise her former husband. And all the stuff about Bosner's brother when Bosner himself obviously still alive, and the writing resembling Mrs Leidner's are contrived attempts at red herrings. Not one of Christie's better efforts. Also, on TV the mask at the window is very obvious. Just how many variations on that lapel badge does Poirot have? Oh, the flowers are real! I'd never noticed that before - duh. So there's one badge but different flowers every time. There's a huge plot hole with Lionrl's glasses. He told Poirot that they're his old pair, and he has new ones on his face as he tells him. So why would have the reserve pair with him at the beach?